A long time ago, when I was just a new human being, I decided that I wanted to go places. As I grew, I came to realize that I could not merely transport myself to that place called Destiny; I would need a vehicle. I made up my mind that I would take the fastest route there. It would need to be sleek, and “smart” enough to get me around in unfamiliar places. I needed it to know where I was going, since I had no clue. The vehicle I chose was alcohol, and the disease it led to was addiction. For many years, alcohol fueled the fast rattle-trap that took me everywhere, and oiled all the bothersome squeaky parts. It never really took me to Happy, of course, although I saw tons of directional signs claiming I was getting close. It always started off in the right general direction, promising to get me where I needed to go. But it lost its way every single day. Sometimes it took me to places that could pass for Happy, if you squinted really hard and were in pretty deep denial. Sometimes it got me worse than lost, landing me in neighborhoods of darkness and despair. It even tried to kill me a few times. Every night as I lay my head down to sleep (or black out), I swore I would never ride in that vehicle again. Never. Never. Never. Still, every new morning, I stepped into the same means of transport, chiding it to take me to Happy, and to remember the way this time. “My destiny awaits!” I would tell it, every single day. But it couldn’t hear me over the bravado of it’s own engine. I was so cocky in my disease, so confident that I was calling the shots. Nothing could be further from the truth. The transportation I stepped into every day by choice was addiction. And every day, for many years, alcohol fueled that fast, rattle-trap, and oiled all the bothersome squeaky parts. If you choose not to disembark from your addiction, you will miss all of the amazing sights. And that’s tragic, because the scenery is breathtaking. The things you do manage see in addiction, you will not remember. If you choose not to disembark, accept that your vehicle only seats one. It’s a lonely mode of transportation. You will crush many under your wheels while you self-destruct, but you will sit by yourself in active disease. 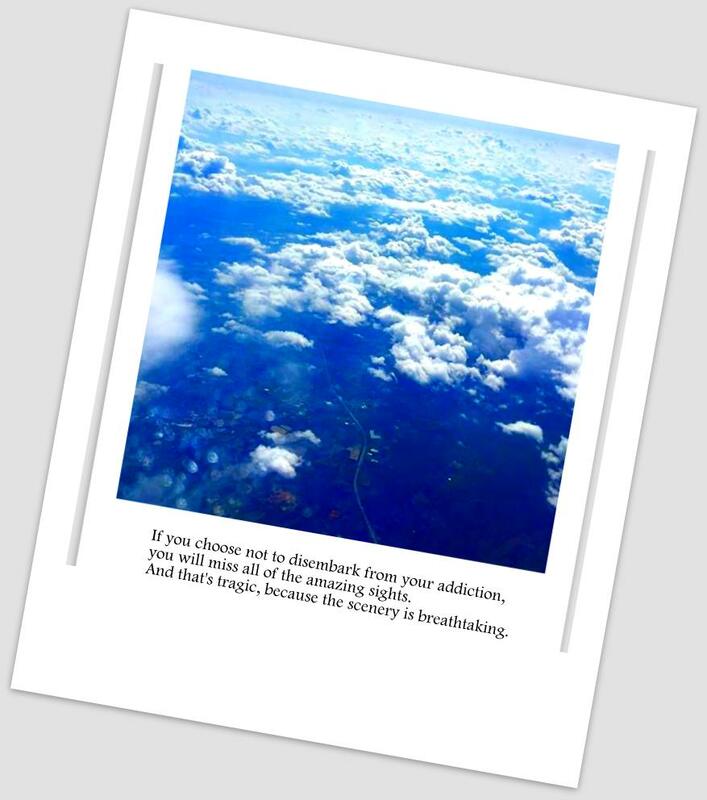 If you choose not to disembark, you will continue to delude yourself that you – and your addiction – know The Way. Essentially, isn’t that what we do? Nobody could stop me from drinking. Except me.Backed by the power of God Himself. Nobody can stop you from using, except you. Backed by the most Powerful Force in the Universe and His mighty angels, the gates of Hell itself cannot prevail against your recovery. You have the power to get out of that vehicle. There is a handle on the door. You might have to feel around for it. You might mash a few buttons or pull a couple of levers accidentally. That’s okay. AH, there is, the handle! I know it feels as if you aren’t powerful enough to pull it, but I promise you that you are. Don’t worry about what will happen when you open the door to step out. The future is nothing to fear. Is life not slowing down enough for you to step out? Open the door and jump out. It will be the first of many incredible, supernatural feats of faith you will employ. The Father will catch you! By choosing Holy Spirit to take me where I need to go and surrounding myself with others who want to arrive at Happy, I am loving the journey. The drinking and using life will never get you to your Destiny, only to Destruction. You can only squint so hard to confuse the two destinations. God is okay with the rattles and squeaks in our spirits. He isn’t bothered by them in the least. He is not impressed with sleekness, nor with getting there the fastest. My first mistake was in choosing that particular vehicle in the first place. I had to kick around a few tires before I chose my new transportation. That’s okay, too. There is a huge learning curve to this Recovering Life. It isn’t about arriving at your destination all in one piece, but experiencing the journey in One Peace. In recovery, you are a new human being again, with places to go, people to see, things to do. Don’t even entertain thoughts of your old ways and means. They literally took you nowhere but down. They have no part of getting you to Happy. Daily ask God to direct you in all that you do. Daily take the time to stretch your traveler’s legs. Gather with others, who – like you – are on the way to Happy. And don’t forget to enjoy the views.